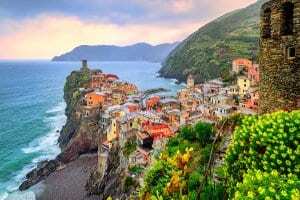 The five beautiful cliff-clinging villages (Monterosso al Mare, Vernazza, Corniglia, Manarola, and Riomaggiore), coined the Cinque Terre (“Five Lands”), rank among Italy’s most magical sights, with their irresistible mix of seaside views, ancient history, wonderful gastronomy and authentic, unspoiled rural setting. 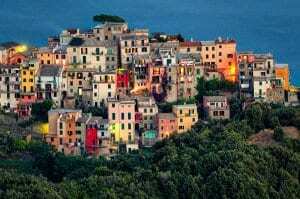 Each town has a distinct character, but all share a similar aesthetic: narrow, tower-like pastel-colored houses cluster atop one another in an appealing hodge-podge pattern, and steep streets are interrupted by staircases cutting through the towns’ historic centers. The scenery in Cinque Terre is simply breathtaking. 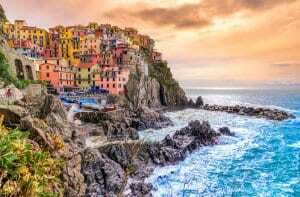 Located in the Italian Riviera, south of the lovely towns of Portofino and Camogli, and stretching 18 kilometers along the Riviera di Levante on Liguria’s eastern coast, Cinque Terre has been declared a national park and a UNESCO world heritage site. Its five villages are linked by train, boat, and trail, and hiking from village to village is one of the most appealing activities here. Scattered between them are a few small beaches where you can swim, snorkel and sunbathe. Beyond the villages, endless terraced vineyards are etched into sloping hills that plunge down to the sea. More than 7,000 kilometers of stone walls prop up these ancient terraces. Wildflowers perfume the air year round and the surrounding countryside is a marvelous area for walking. A web of trails (many of them hundreds of years old) meander through the hills high off the sea, awarding trekkers with breathtaking views. The largest and most popular village of the bunch, Monterosso is split into two parts by the hill of San Cristoforo. 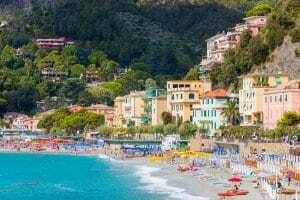 Monterosso Vecchio (Old Monterosso), is where you will find romantic, meandering streets and buildings untouched by time, like the San Giovanni Battista church and the ruins of the Obertengo castrum. 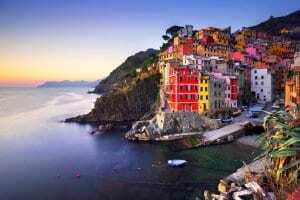 The beach, Cinque Terre’s longest, gives the town a resort feel in summer. Built atop a small peninsula jutting into the water and surrounded on all sides by the glittering Ligurian Sea, pedestrianized Vernazza is probably the prettiest village in the group and has a small, colorful harbor. There is a tiny 14th-century church worth a visit. At the very top of town stands the Castello Doria and the views from its round tower are to die for. The trail to Monterosso takes about an hour and a half and offers captivating views over the coast. The only village not on the water, this is a quiet, quaint hilltop town surrounded by vineyards and olive trees. The town’s main historic site, a 16th-century fortress, sits perched at the edge of the historic quarter, seemingly in danger of toppling over into the sea far below. Also, take time to visit the San Pietro church, considered the most important of the area’s Gothic creations. From here, you have incredible views of Cinque Terre’s shore. Two small beaches flank the town and are accessible via a series of long, steep staircases. Vertical seaside cliffs drop away from this medieval town as though they had been cut with a knife, creating a dramatic profile, especially from the sea. In the village itself, seek out lovely churches like the Baroque San Lorenzo, which dates to the 14th century. From the edge of town, you can stroll the romantic “Via dell’Amore” trail, which runs alongside the sea to Riomaggiore. During the Christmas season, Manarola is famous for its nighttime Nativity scene, which shines more than 12,000 lights on the 200-plus figures that make up the giant crèche. With its petite harbor lined with fishing boats and colorful houses that look as though they’re spilling into the sea, this is a much-cherished spot in Cinque Terre. The pebbly beach just beyond the harbor is a great place to swim. Relaxing in one of the countless seaside restaurants here is the classic way to spend an afternoon in Cinque Terre. Seafood prevails along this coastal stretch, and you will find flavorful anchovies and fried fish dishes alongside more elaborate fare. Pesto, made with the abundant local basil, is a favorite sauce, and it’s served atop pasta, veggies, pizzas and other dishes. Also try local specialties like Farinata (chickpea flour cooked with olive oil, salt, and water and mixed with pesto or cheeses like Gorgonzola and Stracchino). The dry white wines from the DOC Cinque Terre are the ideal accompaniment to the seafood and vegetable dishes here. Follow a meal with the aged sweet wine Sciacchetrà or the popular lemon liquor Limoncino. The longest beach found in Cinque Terre, this stretch of golden sand crowded with colorful umbrellas gives the town an almost 1950’s glamorous atmosphere. This picture-perfect seaside trail runs 2 kilometers along the seaside cliffs between Manarola and Riomaggiore. Of the area’s many trails, it’s one of the most picturesque. The only natural port in Cinque Terre, this lovely harbor is a postcard waiting to happen. There are a handful of lovely small boutique cellars that we can organize VIP private tastings at, as well as convivial Mediterranean lunches at the cellars.